Orange Seal’s Cycling VersaValve is an alloy Presta valve stem for tubeless valve systems, designed to fit rims of all shapes and depths. The VersaValve is available in different lengths; each valve has a large sturdy base and two types of rubber grommets ‒‒ conical and square ‒‒ for an airtight fit. 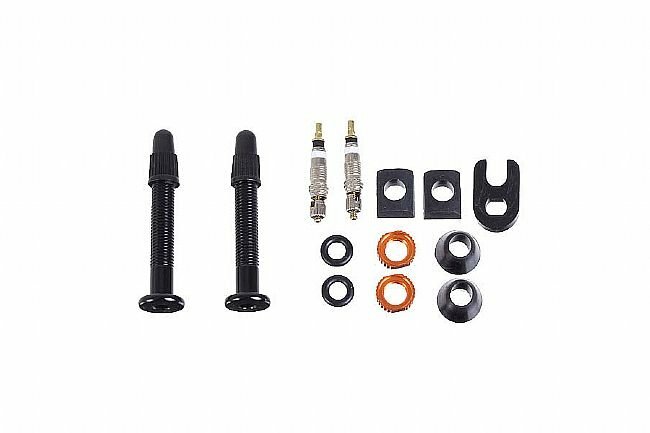 Kit includes: (2) VersaValve stems, (2) conical grommets, (2) square grommets, (2) extra valve cores, (2) orange locknuts with o-rings, and (1) RVC tool. Installed these stems on a tubeless setup on a friend's mountain bike. Works the same as all other tubeless valve stems. The setup comes with a small tool that can be used to remove the valve stem core, or to remove the entire valve stem in case of a flat that requires a tube. Smart to include that, as I suspect many people running tubeless may not have pliers or a tool that will allow them to remove the valve stem nut. I have had so many problems with valve stems leaking and first try these sealed up awesome! The design is so much better than stans. Worth the little extra! Does the job needed exactly as expected. Love the two bases options. Well thought out and functions as it should. Great upgrade for Gravel Grinders! Great solution for converting from tubes to tubeless! Have run tubeless on mt MTB for a couple of years now and this was a great solution for upgrading my Gravel bike!